Father in heaven, thank you for granting me two gifts in my life. The gift of your grace of forgiveness and the gift of mission. With forgiveness I know that I am made acceptable to you and have eternal life. With the grace of mission I have something that I can apply my heart and mind to that is meaningful and fruitful and satisfying. I thank God for the missionaries in UBF who taught me about gospel mission. I thank God for the good folks at KBC where I can apply the gift of mission in creative ways Where would I be with a sense of personal calling in regards to mission? May the grace of forgiveness and the gift of Gospel mission permeate the hearts of people across our land. And now Lord, help me to understand your word very personally. I pray in Jesus’ name. Amen! Paul was compelled to preach the gospel because of God’s grace in his own life. The grace of Jesus should have this affect on us. We have received such great love and healing and freedom and restoration that we simply want to share this good news with everyone who would listen. We preach the Gospel, not because we are trying to get more, “right” with God, we preach the Gospel, because we have been made “right” in the sight of God and we have been saved. Our preaching is simply out or our gratitude and thanksgiving. It can also be born out of our compassion, that we see people who are walking in the darkness, just as we were and we know the Gospel can help them. It can also be born out of our sense of optimism, knowing all the great fruit that Jesus will produce if only the Gospel is preached. When the first disciples were called to follow Christ, their immediate response was to go and tell others about Jesus. When Jesus arose from the tomb, the first response of those who had witnessed the resurrected Jesus was to go and tell others that the Lord has risen. I must and preach the Gospel to people in DeKalb /Sycamore. I want to be able to preach the Gospel to Native people in the remote areas of NW Ontario. I want to be able to preach the Gospel among my own family members. I want to be able to preach the Gospel over the web utilizing my web site. Lord, I am so thankful and grateful for your love poured out on us though Christ that I want to make Jesus known among the nations. I can see the great potential there is when any person accepts Jesus. He offered the gospel free of charge. Look at verse 18 again, “What then is my reward? That in my preaching I may present the gospel free of charge, so as not to make full use of my right in the gospel.” He did not expect any reward. Being able to preach the gospel without some monetary reward was his reward. He was simply happy to be used by God in God’s redemptive plan. There are people in this world who preach the gospel because it is their job. They want a paycheck and health insurance. It is not wrong to receive pay and benefits. The Bible says that we should not muzzle the ox when it is treading out the grain. (Deut 25:4) But then there are those who, like Paul were simply satisfied to preach and teach the Gospel. They even work to support themselves. This is the lay-missionary model. I am a proponent of the lay missionary model. But it only works if there is a Christian community that can provide the fellowship that all believers, especially new believers, need to grow mature in their faith and to find their mission in life. My reward is to be given the opportunity to preach the Gospel. “What then is my reward? That in my preaching I may present the gospel free of charge…” (18a)When I was running a UBF Bible House, there were many opportunities to preach the Gospel. Why? Part of it was because I knew the Gospel from personal experience. But another factor is that I was building up the mission of UBF. Now that I don’t have a UBF house church ministry I don’t expect to be called upon to preach the Gospel very often. (Maybe at DuPage UBF.) There are not many opportunities for a lay person like myself to preach at KBC either. But that doesn’t mean that I can not make opportunities. I can go out and find Bible students to study the Bible with. I can write and post on the internet. I can be ready to preach, so that I can step up when called upon. I am not helpless. There are ways to preach the word of God even when I am not on the church staff. And when these moments arise, I can rejoice because it is my reward from God. He preached the Gospel with a sense of absoluteness. Verse 16b reads, “Woe to me if I do not preach the gospel!” There a saying, “The buck stops here with me.” There is another saying, “If not us…who? If not now…when?” For Paul there was no other option. He needed to preach the Gospel. He knew that there would be some woe upon him if he neglected his calling. This woe is not because God is about to punish him. God can preach the gospel with each rising and setting of the sun. It would be “woe” to Paul because he would suffer in his own heart, for not embracing the mission that God had custom made for him. He would be loosing out. Woe to me if I do not preach the Gospel according to my calling in life. God has called me to preach Gospel in several ways. Through 1:1 Bible study, through Art of Marriage Seminars, through introduce 15 people to the fellowship at KBC, through the sending of missionaries to NW Ontario, through building relations with my family and friends. This is how God is calling me to preach the Gospel in my life. Woe to me if I do not preach the Gospel. I am still saved, yes. I will spend eternity with my Lord and Savior, Jesus Christ. But in this life, I would spend the rest of my days as if I am missing the target if I did not preach the gospel according to my calling. I would suffer inwardly. It would be woe to me. I will not, by the grace of God let this happen. He preached the gospel with a sense of stewardship. Look at verse 17 again, “For if I do this of my own will, I have a reward, but if not of my own will, I am still entrusted with a stewardship.” Stewardship means ownership. Paul could not give up sharing the gospel of life with a world lost in sin. He was discharging his duty before God. He was making the ministry of the word his very own. Every ministry needs people who say, “Even if everyone else leaves, I will stay and, with God’s help, make this happen.” I pray to have a sense of stewardship to the ministries that God has called us to. I pray for my kids to be able to find their own personal mission in life, that they may take stewardship, which is ownership of it. Paul’s point in teaching God’s word was clear: he wanted people to come to Christ and be saved. For this purpose he denied himself and took up the cross of mission becoming all things to all people. What does this mean? I have been given so much freedom. I can literally go from the North Pole in Canada to the Mexican border and travel and work anywhere, freely. I have money to be able to go to any city and most restaurants, theaters and tourist attractions. I am part of the white/middle class/western culture. I do not experience exclusion and discrimination. I feel safe from violence. I have good health and strength and have a wonderful support network. I have freedom and lots of it. But how should I use this freedom? I do not use my freedom in a frenzied attempt to enjoy as much of this world as I can. What is the point if all I did was try to enjoy myself seeking one pleasure after another? Wouldn’t that be fruitless in the end? I would definitely have to answer to God as to how I lived the life I have been given. Those who have no hope in eternity end up doing this. The live by the philosophy, “Let us eat and drink for tomorrow we die.” (1 Cor 15:32) One senior told me, “Enjoy life while you are young because when you are old you can’t enjoy anything”, which is a variation of the above mentioned philosophy. According to Paul, I have been given this freedom so that I can be a servant of all in order that the gospel may reach their hearts. I offer my freedom up to God so that I may be able to share the blessings of the Gospel with others. I can practically do this by getting back to being a 1:1 Bible teacher, preparing the “Art of Marriage” Seminars and engaging in continuous education relating to Native ministry, building my marriage and, first and foremost, growing in my relationship with Jesus Christ. I don’t mind giving up my freedom for the glory of God. Actually it is very satisfying applying myself to live according to my calling in life. It is the most fruitful and satisfying life. The problem lies when you are denying yourself to not live according our calling in life, but someone elses’ calling. Then giving up your freedom is a drag. Paul became all things to all people. 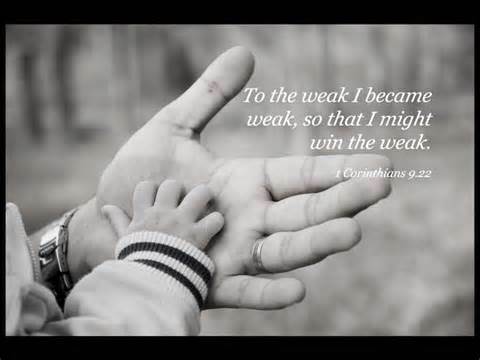 Look at verse 22, “To the weak I became weak, that I might win the weak. I have become all things to all people, that by all means I might save some” Paul did everything he could in order to present the gospel to the people. He denied his own feelings, He gave up his own Jewish culture, and even went against his Jewish conscience in order to reach the Gentiles, those for whom Christ died. He became all things to all people for the sake of the gospel, that he might share in its blessings. How far would we go to become all things to all people in order to help them? I heard of one missionary in Hawaii who actually chose to become a leper in order to preach the Gospel to lepers. Jesus became a human being in order to preach the Gospel to us. (John 1:14) Abraham was called to leave his land, his people and go to a distance place where God was going to lead him. (Gen 12:2-3) He plunged himself into another culture. Those in student ministry have to become student friendly in order to reach students. This is not easy especially when you are in your 30’s to 70’s. What about missionaries from the white culture becoming missionaries to the Aboriginal people to NW Ontario? How can one become all things to all people in that context? Well, you must be there as to be friends and to humbly serve for the long term. You must become one with the people. You need to care about their issues and share a life with them. Would you live on a reserve? Would you live among Aboriginals in the urban setting? Would join a flash round dance in a suburban shopping mall? Would you be at a road block protesting the building of a Chinese mine on tribal lands? Would you promote counseling in your church concerning residential school issues? Would you hang out with Native people on the street simply enjoying their company? Would you learn a Native language even if it gave no benefit to a career? Would you participate in cultural ceremonies? How far would you go, as a white suburbanite Christian missionary to be everything to everyone in regards to Native ministry? I pray that I may be all things to all people in regards to the ministry God has led me too. God wants me to become all things to all people right here and right now? I am called to serve some Bible students in their 20’s and 30’s. I will be called to be all things in regards to Native ministry. I need to be all things to serve my kids with the love of God. The Gospel remains the same, but we as Christians need to change in order to present the Gospel new and fresh to a new generation. There can be a lot of damage if we don’t have a goal to assimilate into the culture. Craig Smith, in his book, “Whiteman’s Gospel” states that the most missionary attempts to the Natives were not incarnational. He states that the target people were forced to become like the people who were delivering the gospel. It was not a Biblical pattern for mission. (p. 123) He states that in order for Christians to right the wrongs done in the past, Christians must revisit the principles of the Kingdom of God. Christianity is not conforming one culture to another culture, for we are all cultures affected by the fall and tainted with sin and basis’. The only kingdom that is pure is the kingdom of God and it’s guidelines for living, are given to us in the Holy Scriptures. (p. 124) We should never try to move people horizontally from their culture to our sin stained culture. What good is that? All cultures need “vertical redemption” and they need to be brought “under the authority and the principles of God and the higher Kingdom of God and its standards.” (p. 124) We need to elevate all elements of all cultures to the standards of God’s kingdom. That means, that when the Gospel comes, some things must stay and some things need to go. Likewise we must not blend the gospel with incompatible elements in an attempt to make them more palatable. This is wrong too. For example you can’t blend animism with the Gospel. But we must not use the standard of the dominant culture to say what needs to go and stay. It must be according to the word of God. Prayer: Lord, help me to teach your word faithfully and become all things to all people so that I may be blessed to be able to preach the Gospel.